Makovsky was always concerned with the costumes of people, namely the princely nobility. Women’s dresses 15-17 centuries. was very bright. The shirts that were on top were always made of bright fabrics. The sleeves on such a shirt should have been decorated with utmost care. Over such an already bright shirt, it was also necessary to wear a dress to the floor. Separate collars, too, were particularly relevant, so they could embroider them with silks or pearls. As for the hat on the way out, then there is no option – kokoshnik. The headgear was also trimmed with special care. As for the wealth of headwear, they are clearly visible in most of the works of the artist Makovsky, and “Under the Crown” is a vivid representation of it. As for the painting itself, “Under the Crown,” the artist directed the viewer specifically to the forefront, which represents an opportunity to see even the slightest nuances of clothing. A bride appears before us, who is immersed in the forthcoming marriage with all her thoughts, is being combed, and the girl who is at this moment just asks questions about her reflections. The girls, who crossed their arms, thereby exposed their magnificent embroidery, located on the sleeves. In this picture, you can see the intersection of two such different and once close lives, one of which is girlhood, and the second one is marriage. The embroidery of the sleeves of the girls twisted by their hands plays thinly. 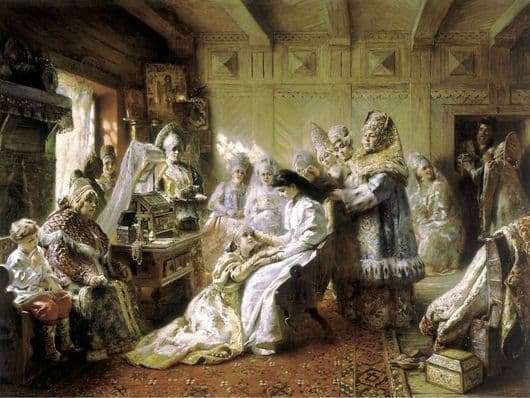 And the third main character of this picture, who is combing the bride’s hair, can be represented as life after marriage. She is a confident and experienced woman who has enough experience in managing households, affairs and raising children.